Stanford University has released a video of three of its researchers sharing champagne and getting a little emotional. Physicist Chao-Lin Kuo is part of a team that announced Monday it's found evidence to support inflation, a theory his colleague Andre Linde has also worked on. Here's why, if you're the type to be moved by major scientific discoveries about the origins of our Universe, you may also get a little misty-eyed. In one of the first tiny fractions of an instant after the Big Bang, the Universe expanded explosively, faster than the speed of light. That exponential expansion of, well, everything, is described by the theory of inflation. And while that theory has been in use for a while, Monday's announcement may confirm it. These are literally small expansions and contractions of space itself, like a wave traveling down a Slinky. We know these exist—we see their effects in astronomy, and two astronomers won a Nobel Prize in 1993 for finding an example of gravitational waves—but seeing them coming from the inflationary period of the Universe is incredibly difficult. We don’t see the waves themselves, but we can detect the effect they had on light coming from the early Universe. But inflation was a contentious idea from start. No one had a firm handle on what the universe was like at such a ridiculously early point in time. The densities and temperatures of cosmic matter were so high that its physics could only be drawn in outlines. While inflation cured many problems for cosmologists, it seemed to lots of researchers like wishful thinking written in advanced math. Despite almost a century of effort, the world's physicists have not been able to show how these theories work together. The primordial gravitational waves that produced the signal seen by Bicep2 were produced in interactions that took place at a trillion times the energies that can be produced in the Large Hadron Collider at Cern. "This is like turning the whole universe into a particle physics experiment," said Hiranya Peiris, a cosmologist from University College London. 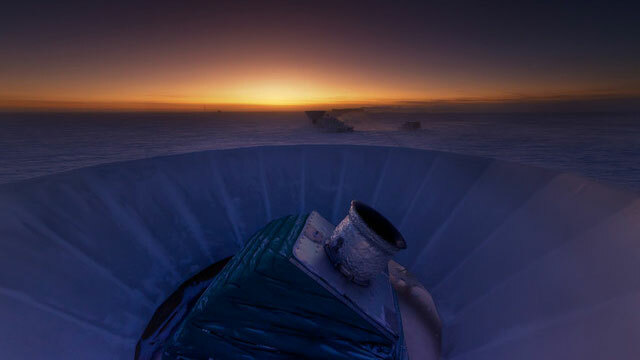 BICEP2, which the Guardian article references, is a telescope at the South Pole scientists used to search the cosmic background radiation for the gravitational waves.